Senator Lindsey Graham recently stated that Donald Trump "is becoming a jackass at a time when we need to have a serious debate about the future of the party and the country." This statement by the Senator is revealing. Lindsey Graham has never spoken this way about a leftist Democrat in his entire political career. 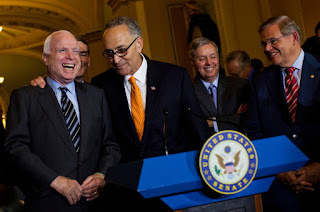 He, like his friend John McCain has chosen to use his toughest rhetoric of his entire career, not toward Harry Reid, not toward Chuck Schumer, not toward the late Ted Kennedy, Chris Dodd, Nancy Pelosi or Al Franken - but rather, toward a fellow Republican. This is what these party imposters do every primary and is why Lindsey & McCain are disgraces we will no longer choose to suffer within OUR party. Mitt Romney's campaign under Karl Rove systematically slandered every conservative candidate, one by one, through the entire 2012 GOP presidential primary until Romney was the last man standing. BUT - once they win the nomination, they have nothing but deference for the Democrat opponents. Once McCain and Mitt Romney finished destroying their- conservative- opponents with sleazy, untruthful and sometimes vicious lies, they both went through the general elections, debates and all, giving Barack Hussein Obama the delicate, kid gloves treatment! I will probably vote for Ted Cruz or Scott Walker but I am an emphatic Trump supporter. I support Donald Trump being ----in---- this race if only for the reason that this man is doing to the under-handed Rovian, FoxNews RINOs, exactly what these frauds have done to us every decade since Ronald Reagan left office. Some of our fellow conservative friends are expressing concern "as long as Trump is in this race, nobody is talking about Ted Cruz's plan, or Scott Walker's plan or Rand Paul's awesome tax cut plan…" I have not yet heard Trump attack one single conservative. As long as Trump is in this race, Rove, Fox, the Wall Street Journal and the rest of the GOP establishment pimps are busy trying to - DEFEND - their pathetic RINOs from Jeb to Chris Christie. So far, Donald Trump is acting more as a cleaning agent against RINO establishment candidates and liberal media stooges. Isn't this obvious? We have not seen this before. We are so used to being bamboozled by these opportunists like Rove that we ourselves don't know what to do! At this time in 2008 and in 2012, we were watching Rove, spending a quarter of a billion dollars destroying our conservative candidates one by one until McCain and then Romney in 2012 were the last candidates standing. These RINOs don't know what to do now. It's like they are punch drunk. The primaries are too long. I support the Donald being in the trenches, doing the scorched Earth hit jobs on the RINOs instead of them doing it -to our candidates- as they certainly would be doing (behind the mask of Karl Rove, Bill Crystal and Fox) for the next 6 months. I would rather Ted Cruz or Scott walker peak in February 2016 then in July 2015. The later debates will give our favorite conservatives a chance to score if they deserve to do so. If they don't rise up on their own and merit the recognition, then they don't deserve it. There is plenty of time to sit back and enjoy witnessing the RINOs being rightfully embarrassed by someone who has the guts to call them out. If the worst thing that can happen is that Trump actually wins the nomination, we would still be better off than we would have been if Rove had succeeded in getting the latest anointed glass jawed RINO the nomination. Even if Trump won and was somehow not a good president, his candidacy has already begun paying dividends for the exposure and lambasting he is giving to congressional and senatorial albatrosses John McCain and Lindsey Graham. Just by running, Trump could potentially clean up the House and Senate by forcing these fossils into retirement - finally. Let's hope those two keep running their mouths and perhaps he can go to work on John Boehner and Mitch McConnell. I just pray that these feather-weight grand-standers cannot resist running their mouths against Trump some more. He will do more than just hit them back.